The television special “Jesus Christ Superstar Live in Concert,” starring Sara Bareilles, Alice Cooper and John Legend has been nominated next to Tony Award winners “The Band’s Visit,” “Carousel,” “My Fair Lady” and “Once on This Island” for a 2019 Grammy Award. Composed by Andrew Lloyd-Webber with lyrics by Tim Rice, JCS Live in Concert featured Legend as the main role, Bareilles as Mary Magdalene and Cooper as King Herod. 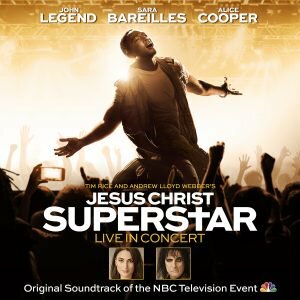 Listen to JCS Live in Concert – Original Soundtrack of the NBC Television Event here! AND order your JCS Live in Concert Barnes & Noble EXCLUSIVE VINYL here!